Francis Fukuyama is not one to shy away from large concepts. He achieved worldwide attention in 1993 for his book, The End of History and the Last Man. He argued that with the collapse of the Soviet Union and end of the Cold War, we had reached the final stage of global ideological evolution and that western liberal democracy was on the verge of a permanent triumph throughout the world (i.e., the end of “history”). Fukuyama then followed up with more ambitious works including, The Great Disruption: Human Nature and the Reconstitution of Social Order (1999) and Our Posthuman Future: Consequences of the Biotechnology Revolution (2002). The author, a Harvard PhD. holder, briefly advised the Reagan Administration in the 1980s, but now serves as a senior fellow at Stanford University’s Freeman Spogli Institute for International Studies. In 2008, he supported the election of Barack Obama and, as demonstrated in his current book, been consistently opposed to populism and immigrant bashing. His latest work tackles another big idea, human identity, and contains a serious warning about the rise of nationalism and racism around the world, particularly in the United States and Europe. While other authors examining the rise of populism might cite economic statistics and voting trends to make their case, Fukuyama instead quotes widely from Socrates, Plato, Hegel, Marcuse and Nietzsche. Fukuyama sees citizen identification with their own nation state as an important part of liberal democracy. In contrast to most progressive leaders, he does not view multiculturalism and the celebration of different ethnicities and sexual orientation as a step forward to more personal freedom. Instead, he sees these new demands for individual identity as destabilizing to modern nation states. One result is the rise of conservative governments that seek to socially ostracize or even physically expel minority populations. What actions can liberal democracies take to protect minorities while strengthening their traditional freedoms? Fukuyama believes that the United States is ahead of many countries by requiring citizenship tests that include a basic knowledge of English, an understanding of the nation’s history and democratic principles. Many European countries do not impose similar requirements for citizenship. Instead, the European Union has encouraged “multiculturalism” and “downplayed the importance of integrating immigrants” into a specific “national culture” that emphasizes that country’s history and democratic values. The tension between these two drives is present in all liberal democracies, which seek to deliver equal respect to all individuals. In practice, many groups, particularly religious or ethnic minorities, can feel marginalized or denigrated by the ruling majority. Megalothymia becomes a major problem when an aggressive majority group takes power and seeks to socially ostracize or even exterminate a minority group. Nazi Germany is the ultimate expression of this trend in the 20th century. 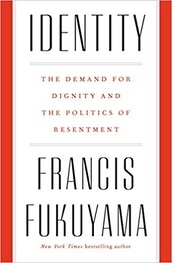 Fukuyama follows up his examination of identity politics with a series of recommendations. The title of his last chapter, “What Is to be Done?” is an ironic reference (he is no Marxist) to Lenin’s famous 1902 political pamphlet. In the United States, progressives should “adopt an assimilationist agenda.” This would include “strengthening external borders” while providing a clear path to citizenship for the 12 million undocumented men and women now in the country. He also wants public education to phase-out bilingual education and focus on teaching all students English language skills. He cites the “thirteen different languages taught in the New York City schools” as a divisive factor, weakening a national identity and fostering segregated communities. He advises progressives to return to the traditional working-class issues of economic redistribution and improved government services (e.g. education, child care). Is Fukuyama right? Should progressives try and recapture white, working class voters by downplaying minority rights and espousing a national creedal identity? Whether you agree with his solutions or not, Fukuyama’s analysis is insightful and provides plenty of food for thought. It is a welcome antidote to the many pessimistic, hand-wringing books now appearing about the rise of Trump.